Ros has been an instructor at XYZ for over 3 years but before that he was a highly competitive road cyclist competing in Hong Kong and South East Asia in seasons 2009-2012. We caught up with Ros to fill us in on exactly what’s working when we are working out. IN AN INDOOR CYCLING CLASS WHAT ARE THE MAIN MUSCLES GROUPS WE ARE WORKING? In an XYZ class, it really is all about a full body workout as we have incorporated the arm section into the ride. Obviously cycling predominantly uses the legs but to maintain a strong riding posture, the abdominal section plays a big part. It’s kind of like an anchor for your ride. It’s what helps you keep the upper body relaxed but stable. SO WE HEAR INSTRUCTORS TALK ABOUT THE PEDAL STROKE. WHAT ACTUALLY IS THAT AND WHAT’S HAPPENING? The pedal stroke is the 360 circle you make with your feet when riding. 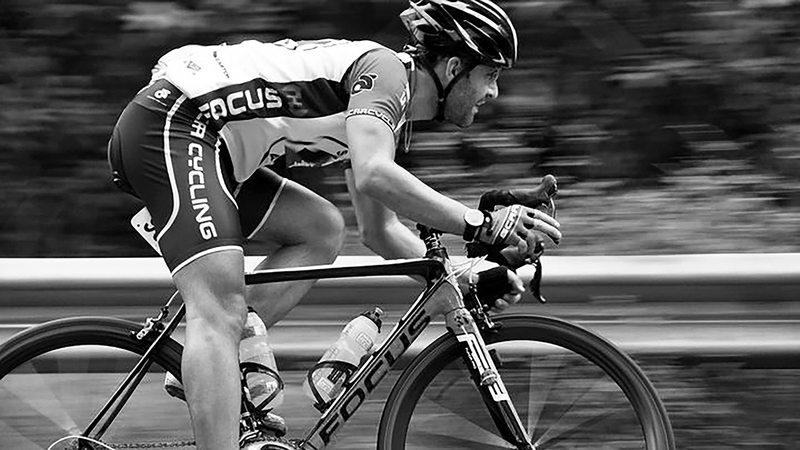 Starting at the top of the pedal stroke is 12 o’clock when the foot is at its highest. This is actually a dead spot in the pedal stroke. As you push down from 12 o’clock to 5 o’clock this is the most powerful part of the pedal stroke and has the greatest muscle activity. Think about driving down more through the heel than the the toe. Toes should not be pointing down. Then as you reach the bottom you want to feel like you’re scrapping mud of the bottom of your shoe before you pull up through the back stroke. The pulling up action is important as pushing down. Even though you create more power in the downward stroke you want to try and keep your circle as smooth as you can. Not over forcing one part of it. SO WHAT ARE THE LEG MUSCLES USED IN CYCLING? To keep it simple think of your quads doing most of action in the downward stroke then your glutes and calves take over around 6pm, then your hamstring sweeps the pedal back to 9pm and your hip flexors help lift the pedal back to the top to start all over again. DO YOU STILL DO MUCH OUTDOOR CYCLING? I still try to get out on the road at least once/twice a week if my schedule and weather allows. For me it is the best feeling to hit the road and ride along the coast on a beautiful sunny day, worry about literally nothing. complete relax for the mind and soul.